RYOBI ONE+ ANGLE GRINDER 18V R18AG: Yet another fantastic addition to Ryobi's top notch 'one+' power-tool range. This cordless angle grinder's great for cutting metal sections, grinding rough steel, or the burrs and swarf left after cutting and welding. Change the disc over to a more suitable type, and stone, bricks and masonry can be cut or smoothed too. 18V cordless means there's still plenty of power - without the inconvenience of trailing leads or cables. The Ryobi R18AG 18V One+ Cordless Angle Grinder is extremely versatile and has a wide range of uses from cutting and grinding metal, sharpening blades, shaping stone or paving to removing rust and loose paint of metal and polishing. The 3-position handle ensures comfort and optimum control across all cutting and grinding tasks. Whilst a tool-less wheel guard and spindle lock makes it quick and easy to change accessories and adjust the position of the guard. 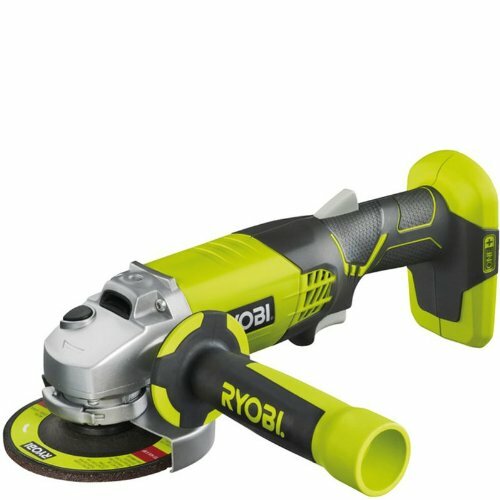 For added comfort Ryobi’s unique micro grip texture makes the angle grinder easy to hold and use for extended periods. The R18AG is part of the Ryobi One Plus range. One Plus is the world's largest interchangeable cordless power tool system, with its batteries powering over 35 garden and power tools, removing the added expense of buying extra batteries. Battery powered technology gives you the freedom and convenience to carry out projects whenever and wherever you like, without the hassle and restraint of cables and power sources. This tool is compatible with all Ryobi One Plus batteries. This stops unnecessary batteries and chargers being brought every time you purchase a one plus tool and saves you money - One battery powers them all!